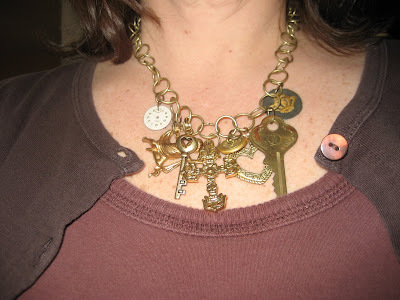 Will you check out this beautiful necklace? I was gifted this via David, via Debbie, via Lauri. 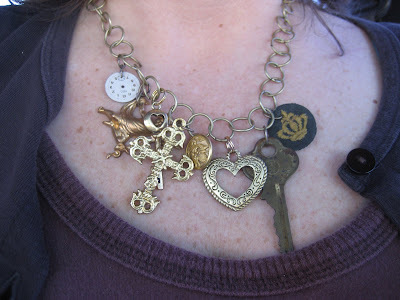 Mindy, I'm lovin' your necklace...yes, you are the lucky one! I was going through your recent posts and wanted to tell you that I lovelovelove your hair short...it's cute now too but for Texas summers, you can't beat short hair! Well of COURSE it looks beautiful on YOU! 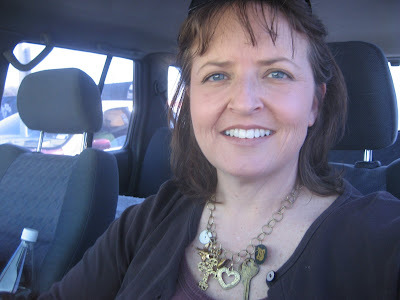 Hi Mindy - A pretty necklace and going to Round Top. You are one lucky girl! Have fun! How gorgeous...you are one lucky lady! Beautiful, just beautiful. I too have one and love mine! Wow Mindy - that sure is fab! You are the lucky one--love it! That necklace is fabulous! A real statement piece. And it looks great on you, Mindy! Very cool. And god you have a pretty smile.